Faiez Serraj has revealed his main points of discussion for the Palermo conference on 12-13 November (Photo: LH Archives). Faiez Serraj, the head of Libya’s internationally-recognized Presidency Council and Government of National Accord (PC/GNA) has revealed his discussion agenda for the planned conference on Libya in the Sicilian city of Palermo on 12-13 November. 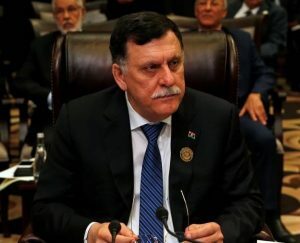 The revelation was made by Serraj’s official spokesperson, Mohamed El-Sallak, during yesterday’s press conference at the Media Centre of the Prime Minister’s Office in Tripoli. El-Sallak said that the main points of discussion for Serraj were firstly, the affirmation of both the presidential and parliamentary electoral process, conducted on a constitutional basis. Secondly, El-Sallak said that the ending of the existence of parallel state institutions and the consolidation of all existing state institutions will be one of the main discussion poìnts. Thirdly, El-Sallak said that Serraj will insist on the continuation of the implementation of the (new) security arrangements, which are stipulated in the 2015 Skhirat Libyan Political Agreement (LPA). Finally, El-Sallak said that Serraj will want to discuss the newly implemented economic reforms.